With all the eating and eating this holiday season, it is hard to stay on track with my " South Beach" approach to eating the past few weeks. In an effort to enjoy my birthday today and not succumb to cake, I made some healthy-yet-delicious oatmeal cookies. They came out wonderfully! Make a batch tonight and nibble on these when the egg-nog ice cream urge attacks. Cream the butter and sugars with a mixer. The butter mixture will have more texture than typical creamed sugar/butter. When the sugar looks well incorporated, add the egg and vanilla and whip more. Using a spoon or a spatula, hand mix the oatmeal, flour, baking powder and cinnamon until well incorporated. 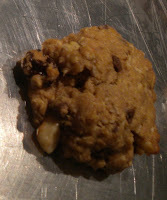 Then add the raisins, nuts and chocolate chips and mix well. With your hands, shape into 1 1/2 inch patties and flatten lightly with your hand. Place on a baking sheet a couple inches apart. Bake until edges begin to brown, then flip the trays in the oven (at about the 8 minute mark) and continue cooking for an additional 5-8 minutes. When the cookies have a nice golden color, take out of the oven. Let sit on the trays to cool down for 10 minutes. Then place cookies on a cooling rack to continue cooling. Keep in an airtight container for 4-5 days. Enjoy with less guilt! I have found that if your flour is too dry, the dough will be stiff. If you find this, add about 1/2 cup milk while adding chopped nuts. I also found chopped hazelnuts add a wonderful flavor.